In recent years, many competitive smart phones have been made by Android manufacturers. Running on Android OS, which is known for highly openness, these quality cellphones are very popular on global market. Undoubtedly, Samsung is one of the most outstanding brands. And Samsung Galaxy phones must be the most shining stars. Whether you have got a new Samsung Galaxy or are thinking of buying one, if you don’t want to start from scratch, learn how to transfer data from old Android, like HTC, LG or Sony, to Samsung Galaxy S6/S6 Edge/S7/S7 Edge or the newest S8/S8+ now. Why Not Using Samsung Smart Switch? * Smart Switch does NOT support phones running on Android OS lower than 4.0. * Smart Switch is NOT compatible with some phones. * For some non-Samsung phones, Smart Switch ONLY supports a small part of all the file types. Whether to use Smart Switch or not, it mostly depends on your old phone. 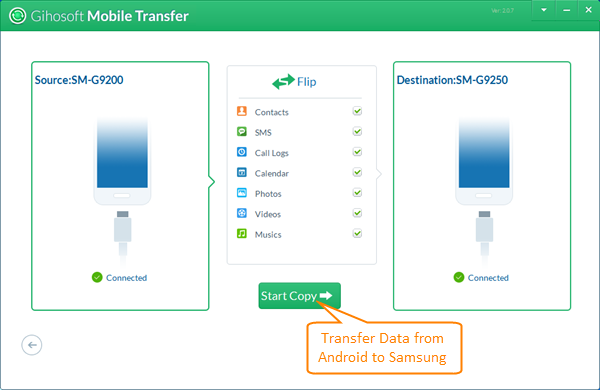 If you still want to know more details, please refer to how to use Smart Switch to transfer data to Samsung. Actually, there has another powerful, complete and user-friendly phone to phone data transfer tool available for you, Gihosoft Mobile Transfer. Data transfer between Android and Android, iPhone and iPhone, Android and iPhone, even from iTunes to Android or iPhone. Compatible with Android 2.1 to 7.0(or later), iOS 5 to 10(or later). Support all data, like contacts, SMS, call logs, calendar, photos, music, videos, etc. 100% complete transfer without missing or damaging. Absolutely secure transfer without virus or privacy leaking. Visible processing bar, know exact number of data transferred at any time. Download and install Gihosoft Mobile Phone Transfer to your computer, then run the program. Tap “Phone to Phone” and connect the two Android phone to computer via USB cables. Tick after the file types that you want to transfer, then click “Start Copy”. Note: Along the transferring procedure, you will be able to view the processing bar and know how many data have been transferred. Please do not disconnect the two devices until “Transfer Completed” pops up. In addition to Android to Samsung data transfer, with Gihosoft Mobile Transfer, you can transfer data from old iPhone to Android Samsung Galaxy S7/S7 Edge/S8/S8+.